A rendering of the proposed CalgaryNEXT arena. The National Hockey League’s Calgary Flames need a new stadium. At least their owners say they do. The 35-year-old Scotiabank Saddledome is perfectly functional, but the team owners’ dream project was CalgaryNEXT, a new Bow-riverside complex home to the Flames and the Canadian Football League’s Stampeders that may also pull in more concert revenue. The proposed multiplex made a compelling pitch until the price tag appeared—$890 million, of which Flames ownership would pitch in just 22 percent. The remainder would come from taxpayers. Yet even $890 million proved optimistic, as the wildly underestimated price tag inflated to $1.8 billion, with Calgarians assuming two-thirds of the bill. The Flames would also pay no property tax. An unimpressed municipal government replied with a deal offering a rough 50/50 split in cost with the team paying taxes. Talks quickly broke down when Flames’ ownership opted not to negotiate in good faith, but instead reacted like children denied a new toy. Led by CEO Ken King, the team walked away from negotiations, called in NHL commissioner Gary Bettman to threaten the city, and inappropriately inserted themselves into Calgary’s 2017 mayoral election. When arena-skeptic Naheed Nenshi was elected to a third term, the Flames’ media relations director tweeted, “Having @nenshi as mayor is worse than @realDonaldTrump being president,” using the hashtags “#arrogant” and “#outoftouch.” Murray Edwards and Clayton Riddell, two of the team’s owners, are worth a combined $4.8 billion. Edwards, Calgary’s second-richest man in 2016, would not have seen a nickel of his tax dollars fund CalgaryNEXT—his legal home is in the United Kingdom. King’s most recent tactic has been to make the (likely) empty threat of moving the Flames from Calgary, where they have played since 1980. The relocation is improbable. Despite Bettman privately suggesting to Nenshi that the Flames jumping ship could destroy his political career, 75 percent of NHL owners would have to approve the move and open up the logistical mess of reformatting the league’s schedule. One of the most commonly cited possible destinations, Seattle, is now receiving an expansion team, leaving few potential markets offering both Calgary’s size and proven rabid fanbase. Research from the Washington-based Brookings Institution and others have shown for at least two decades that publicly funding stadiums never works out in taxpayers’ favour—the proposed benefits never materialize anywhere near the extent of making up for costs. Only owners profit. While not new, the debate over taxpayer-funded stadiums has taken an ugly turn in Calgary: Supporters of the NEXT project, like the right-leaning Calgary Sun, have criticized the municipal government for investing in the supposedly wasteful evils of public libraries and bicycle paths. These are services that the majority of Calgarians support and anyone can use, regardless of whether they can afford pricey hockey tickets. The Sun has since deleted the offending article. All of this could be setting a nasty precedent for Canadian sports cities: that billionaire owners, instead of sitting down to negotiate, can bluff, threaten, and lie to get their way. Historically, Canadian cities have done well in standing up to pro-sport bullying, but the tide is shifting. Quebec City built a $400-million stadium almost entirely with public money to fill a Nordiques-sized hole in their heart, solely in the vain hope of enticing an NHL team back to town. The 2012 renovation of Vancouver’s BC Place also went over budget, up from an initial estimate of $365 million to a final whopping $514 million price tag, all paid for with public cash. While Calgary has yet to crack under the pressure, the NHL’s Oilers strong-armed the City of Edmonton into paying the majority share of a new arena by threatening to move. Their new rink, whose budget ballooned to $604.5 million, was pitched as part of an urban revitalization project for downtown Edmonton. Dubbed the Ice District, it consists primarily of luxury condos, hotels, and corporate headquarters, and its development is being handled by a real estate company controlled by none other than Oilers owner Daryl Katz. 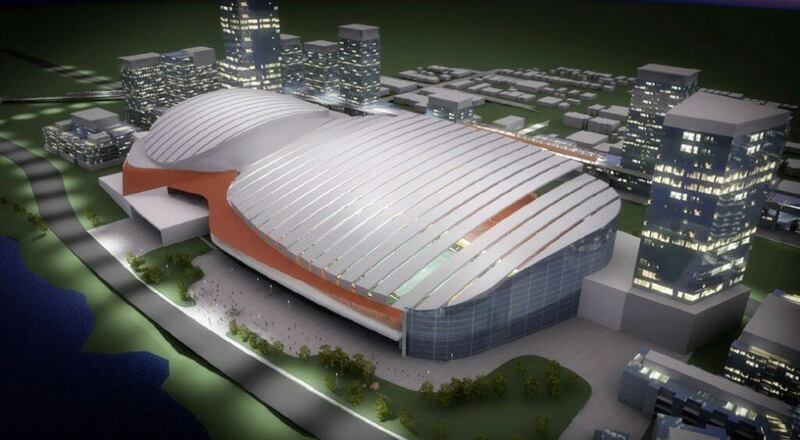 Taxpayer-funded arenas simply do not benefit taxpayers, as the Calgary saga has shown. But in the face of underhanded tactics and open threats from billionaires denied vanity projects gifted by fans and non-fans alike, the faulty math is worth remembering. Sports franchises, while powerful social institutions and potential sources of civic pride, are simply another form of entertainment. You pay for a film ticket—you don’t subsidize the movie theatre.